Boaters can cross easily between Canada and the United States, but need to pay close attention to immigration and customs regulations. Years ago, I chartered a boat in Canada and sailed to the United States, clearing Customs in the San Juan Islands, Washington. A Custom’s officer asked whether we had any fruits or vegetables aboard. I said, “Just two potatoes.” He expressed regret that he had to confiscate them. We received our clearance as he walked off with half of our next day’s breakfast! A year after the 9/11 terrorist attacks, I was planning another sail to the States and was curious to know whether there would be any difference in clearing Customs. Would their officials be more vigilant and inquisitive? 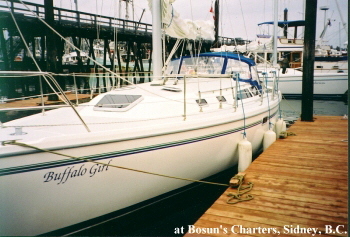 Our trip began in Sidney, British Columbia at Bosun’s Charters where we rented two 36-foot Catalinas. The primary purpose was to offer a one-week “hands-on” sailing experience to eight students from the Canadian Power & Sail Squadrons (CPS). David Levine, my co-instructor in the Edmonton CPS Boating course, skippered one boat and I the other. Our itinerary took us across the border into the San Juan Islands, an archipelago of some 200 islands, many of which have been designated wildlife reserves or marine parks. In preparation for our trip, I called U.S. Customs to inquire about allowable food items. They advised me to contact the Department of Agriculture (USDA) as Customs only enforces the USDA guidelines. The USDA official informed me that meats from the United States and Canada are allowed (although a recent “mad cow disease” scare changed that). Fresh fruits grown in the States or Canada are also allowed provided they are “in season” and marked with brand labels. Citrus fruits must be in an intact bag or box and clearly labeled. A couple of oranges or grapefruits would probably not be allowed although the official wasn’t sure whether Customs would actually confiscate them. Fresh vegetables are allowed if grown in the U.S. or Canada with the exception of potatoes grown in Canada. Idaho potatoes would be allowed if clearly labeled. If there is any doubt about the origin, fruits and vegetables are prohibited. We made up our shopping list with these guidelines in mind. We also restricted alcoholic beverages to one bottle per person to avoid paying duty. Don’t even think about not declaring an agricultural product. A smuggled orange or potato might carry microscopic pests that could devastate the agricultural industry, causing millions of dollars in losses. That’s why the penalties are so severe for smuggling –- up to $50,000 in fines. The boater is responsible for knowing the prohibited foods. Even if Customs doesn’t ask, “failure to declare” your fruits and vegetables may result in a fine of $100 or more. During our boat orientation at Bosun’s, Peter (a staff) explained that each charter boat has a User Fee Decal attached to its side which costs $25 US annually and allows the boat to enter U.S. waters. He emphasized the importance of going to a port-of-entry and clearing Customs before we anchored or docked anywhere else –- fines for this infraction can be up to $5,000! 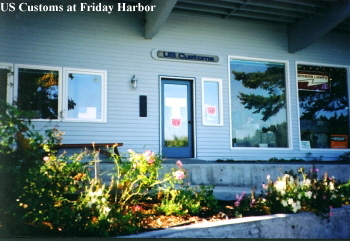 Peter also told us that the Customs office at Roche Harbor, our closest port-of-entry, had just closed on Sept. 15 for the off-season; however, we could dock there and call Customs at nearby Friday Harbor, Washington to clear by phone –- maybe. Or they might ask us to wait aboard while an officer drove over to conduct a further inquiry. On a typical day, the entire U.S. Customs Service makes over 400 seizures of illegal goods, about 100 of which are food items. As suggested, we tied off at the dock in Roche Harbor and I called Customs. The friendly but officious-sounding officer first asked for my PIN number (Personal Identification Number). When I said, “Huh?” she asked for my home phone number and my address. She then asked a series of questions: the name, type, and size of our boat, its license number and User Fee Decal number, the nature of our visit (recreational boating), and how long we were staying. She also asked for the name, date of birth, and citizenship of each person on board. Finally she asked what we were bringing into the U.S. My answer of “just some edibles and a bottle of alcoholic beverage per person” seemed to suffice. She then provided me with a PIN number, which was actually my home phone number, for future border crossings. She also issued a “clearance number” for the boat to be made available to any official who requested it. Until clearance is provided, no one (except the skipper to speak with Customs) is allowed to leave the boat. Violation of this rule may result in substantial penalties and forfeiture of the boat. A day later I visited the Customs office at Friday Harbor and requested a handout outlining allowable and prohibited food items. Surprisingly, the officer said they didn’t have one because the regulations change from day to day. When I asked more specific questions, however, he agreed they enforce the USDA guidelines, but he didn’t have a handout of those guidelines. While in Anacortes, I called Canada Customs to see if we could receive our clearance by phoning their office in Sidney from another port-of-entry, Bedwell Harbour, which had also closed for the season. The officer informed me that we would have to clear in Sidney by placing a call to their office at the nearby Victoria International Airport from the Customs dock. I asked how long this clearance would take and she said, “it depends on whether the officer wants to ask more than routine questions or come over to inspect the boat.” She suggested we allow time for this possibility. As it turned out, we were able to clear in Sidney with a brief phone call, giving much the same information requested by U.S. Customs. Within 15 minutes, we were back at Bosun’s. Before taking a boat across the border, I suggest that you contact the USDA for a copy of their latest food guidelines. Also, be sure to have the U.S. and Canada Customs’ phone numbers in case the port-of-entry offices are closed. Also have available your boat’s license number, User Fee Decal number, and passports for all crew, and answer all questions truthfully –- you’ll likely be on your way in short order. Although not much has changed since my pre-9/11 visit, the level of vigilance at the border will vary depending on the existing level of threat to national security. When you visit Customs, just remember that they are very busy keeping our borders safe and secure, and would much rather clear you efficiently than to have to search your boat for a couple of smuggled potatoes! 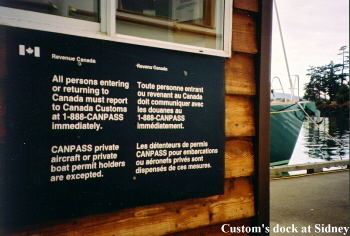 Canadian recreational boaters who make frequent trips to the States can obtain a Canadian Border Boat Landing Permit (Form I-68) from US Customs. This annual Permit ($16 for the boat owner to a maximum of $32 per family) allows them to enter the States for up to 72 hours without reporting to Customs for further inspection. To obtain a Permit the boat owner and family members over 14 years of age must appear at a port-of-entry for a boat inspection and personal interview, including a photograph and fingerprint. A boater with an I-68 Permit, or a PIN number, may contact U.S. Customs by phone an hour before crossing the border to obtain a clearance number. Boaters without an I-68 Permit must report at a port-of-entry or use one of 37 Outlying Area Reporting Stations (OARS) installed at public marinas along the border. These user-friendly videophones enable two-way visual and audio communication between the INS inspector and the boater. To use OARS, the boater must have a valid, stamped Arrival Departure Record (Form I-94) previously filed at a port-of-entry ($6). Meats from Canada or U.S. Dairy products from Canada or U.S.